The Amy Gillett Foundation welcomes the ACT government’s implementation of a minimum distance when overtaking bicycles as part of a new package of road safety laws designed to make bike riding safer in the ACT. To begin on 1st of November 2015, the ACT will commence a two year trial of the ‘metre matters’ rule that requires drivers to provide a minimum distance of one metre when overtaking a cyclist in speed zones at or below 60km/h and 1.5 metres in speed zones above 60km/h. The trial follows an ACT Legislative Assembly inquiry into vulnerable road users last year which identified a range of measures that could be introduced in the ACT to improve safety for cyclists and other road users. In its response to the inquiry, the ACT government has agreed to undertake the two year minimum passing distance trial. The government also agreed to develop a community awareness and education strategy for the trial and establish a Cyclist Code of Conduct for the ACT. Amy Gillett Foundation interim chief executive officer Belinda Clark congratulated the ACT government on delivering on the commitment it made following last year’s inquiry and said the trial will make bike riding safer in the ACT. “Amending the road rules to mandate a minimum overtaking distance will help reduce crashes between vehicles and bike riders by changing behaviour,” Ms Clark said. 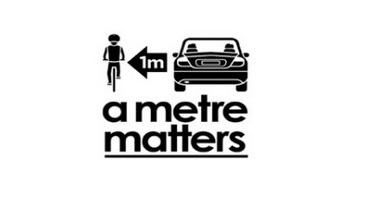 “A metre matters because it provides a practical measurement for drivers when overtaking bike riders. As Australia’s leading bike rider safety organisation, our mission is to achieve zero bike fatalities in Australia and this move will make a difference in achieving that goal. “It provides a practical measurement for drivers when overtaking bike riders. In 2014, the ACT had 33 crashes involving cyclists hit either from behind or side-swiped in the same direction. Introducing a minimum overtaking distance will improve road safety for cyclists as it will clarify the law and remove doubt for drivers over what constitutes a safe distance when overtaking people riding bicycles. “This trial is about sharing the road safely together. A metre matters on all roads in the ACT, regardless of whether there are bicycle lanes or not. “The ACT has joined Queensland as a leader in cycling safety, strengthening its position as a bicycle friendly city, and the Amy Gillett Foundation congratulates the ACT government for implementing the new road safety laws.” Ms Clark said. The trial is working well in Queensland and three-quarters of Queenslanders support the minimum overtaking distance, as found by community attitudes research the Amy Gillett Foundation commissioned. Almost two-thirds of bicycle riders noticed an increase in the space drivers give them since the Queensland Government’s landmark trial legislation was introduced in April 2014. “We have welcomed the opportunity to work with the ACT government, roads authorities, bicycle and motoring organisations, the police and other organisations to get to this point and look forward to a successful trial so that the amended road rules stay in place after the trial ends in November 2017,” Ms Clark said. ACT Minister for Justice, Shane Rattenbury said the ‘metre matters’ laws have already achieved success in QLD where the trial of the laws is working well and SA, where they will be introduced soon. “When driving a vehicle, we need to remember that we are in control of around 1,200 to 2,000 kilograms of metal, travelling at more than 12 metres a second when driving at 50km/h – which can kill in an instant. “On the road, cyclists are particularly vulnerable because they are smaller and have less crash protection than motorists. To support the amended road rules drivers are allowed to cross centre lines, straddle lane-lines and drive on painted islands, provided the driver has a clear view of any approaching traffic and that it is safe to do so. “An awareness campaign will commence in mid-October to educate road users about these changes and ensure everyone understands the new rules,” said Mr Rattenbury. Pedal Power ACT executive officer John Armstrong said the trial is a welcome protection for bike riders in the ACT. “The safe overtaking rule is already there, but this provides a number for the driver to think – am I giving the cyclists a metre or 1.5m when I’m overtaking? It’s a great move to assist cyclists, who are vulnerable road users, and it will certainly be welcomed by Pedal Power members in the ACT,” Mr Armstrong said.